In today’s real estate market, having ample storage space increases the value of your home. Whether your home’s existing garage is too small or you do not have a garage at all, adding a steel building is a cost-effective way to increase the value of your home. If you are interested in purchasing a steel building, you have come to the right place: At Alan’s Factory Outlet, we offer North Carolina residents the best selection and the lowest pricing on prefabricated metal buildings. 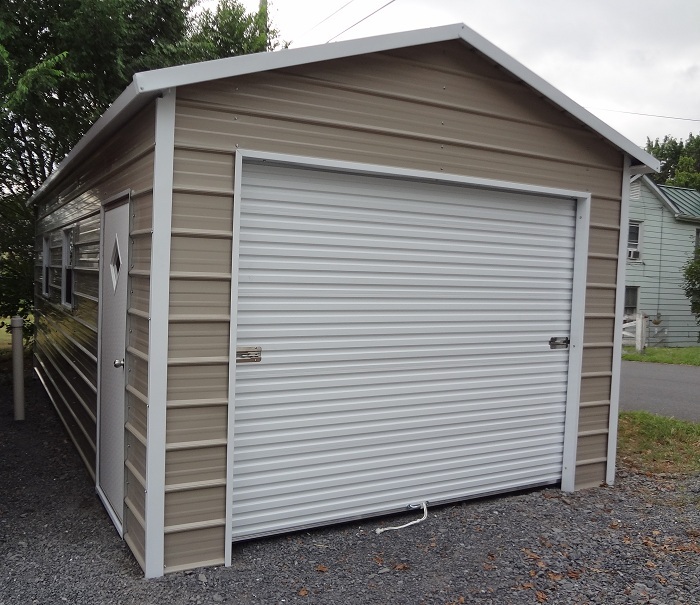 We offer multiple types of storage buildings for sale in NC, and we offer free delivery and installation in all of NC, including Charlotte, Raleigh, Greensboro, Winston-Salem, Durham, Fayetteville, Cary, Wilmington, and High Point. Our steel buildings in NC offer homeowners the versatility, the affordability, and the structural strength they need to protect their valuables. The metal buildings from Alan’s Factory Outlet are built with 14-gauge tubing and 29-gauge sheeting. Thicker 12-gauge tubing is also available, and it has a 20-year rust-through warranty. As an additional safety measure, our steel buildings in NC come with center braces, and homeowners have the option to add braces on both sides. 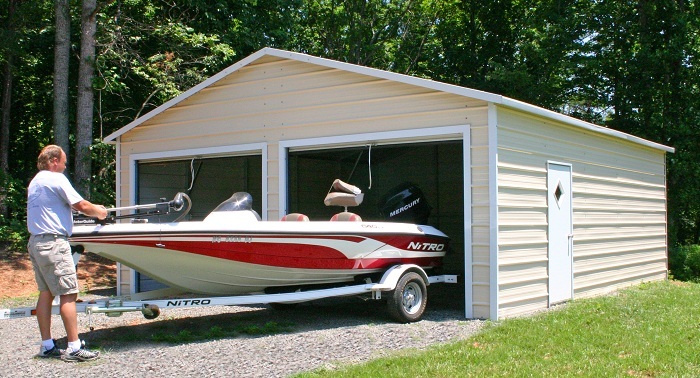 North Carolina garages from Alan’s Factory Outlet can be built in many different sizes and styles, including one-car garages, two-car garages, and metal three-car garages. 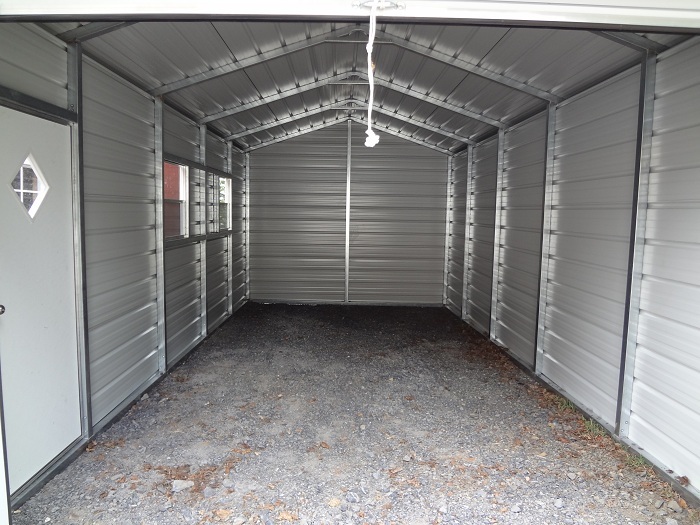 Whether you own one vehicle or several, you will find the extra storage space you need in one of our metal garages. North Carolina residents have trusted us for years to help them with their garage needs, both big and small, and when you shop with us, you’ll see why. Don’t want to fully enclose your vehicles or other property with our metal garages? North Carolina customers can also choose to buy a custom carport, which can be partially enclosed or open-sided. Our carports are also delivered and set up for free throughout North Carolina. Blueprint drawings are faxed to your local building inspector. The garage is fully braced and comes with a 130 mph wind rating. Please note that there is an additional cost for certified metal garages. The cost is associated with additional tubing required on both the front and back ends of the garage. Call now or order online to reserve a steel building or carport that will meet all of your storage needs. With Alan’s Factory Outlet’s low prices on custom metal buildings, NC customers are sure to be satisfied and save money, too.